KitchenAid 6-Qt Slow Cooker Just $55.99! Down From $130! Shipped! 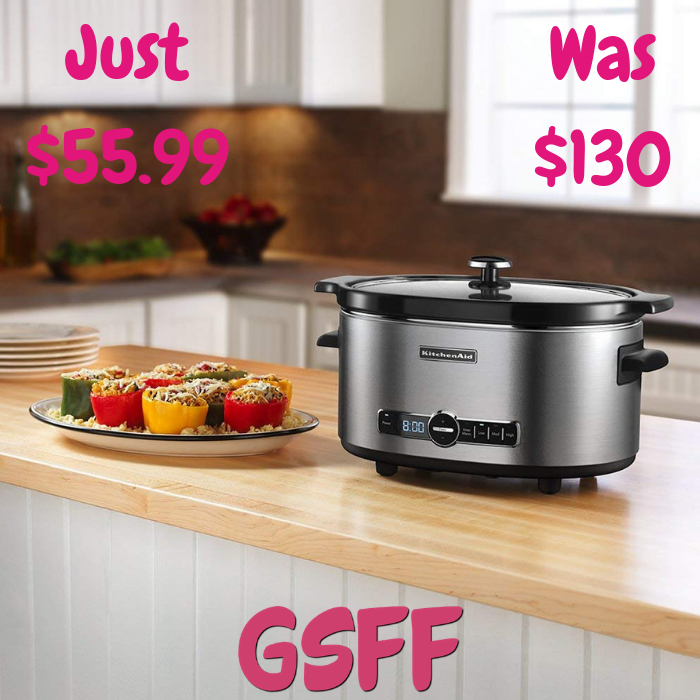 You are here: Home / Great Deals / Amazon Deals / KitchenAid 6-Qt Slow Cooker Just $55.99! Down From $130! Shipped! At Amazon, you can get this KitcehnAid 6-Quart Slow Cooker for only $55.99 down from $129.99 PLUS FREE shipping when you apply the extra $14 coupon located below the price! This slow cooker is perfect for every course, from hearty soups and tender meats to decadent desserts. It includes 4 temperature settings – LOW, MEDIUM, HIGH, KEEP WARM – to ensure your culinary creations come out the way you intend them. The Easy Serve Lid is hinged on either side of the handle and allows for easy access and one-handed serving. The oval-shaped ceramic vessel is removable.